No I didn't try to bunny hop this one. A short 11 miler on the ice spikers in freezing cold but bright and sunny, too good to miss! The start of the week and no snow to be seen, but trouble a plenty with the rear wheel and tyre which I think I've eventually fixed. Today and there's snow and ice with the temperature below zero again. At least the sun was shining today and daylight is lasting a bit longer. A bit of track I've not been on for over a month. Wednesday was a no go with wet snow showers non stop throughout the day but today, Thursday, the weather has improved, really cold but dry and sunny so a short ride was in order.Conditions have turned icy again so it looks like the spikers will be back on for the week-end. The only photo of any consequence this week, taken last night before the icy descent to the Howe. The beginning of the week saw the lowest temperatures of the winter so far and by the middle of the week it was definitely ice spikers front and rear for safe riding. Four of us out on Wednesday night, two of us with spikers and two without, and the difference was like chalk and cheese. However by Saturday night when Baz and me went out a lot of the ice had gone though the spikers were still needed for some of the sections. By tomorrow, Monday, I reckon it'll be back to the usual tyres though winter is forecast to return by the end of the week. The descent down the valley, snowy and icy. Start of the road down from the Howe, also very icy. My two riding buddies this morning discussing some world important issue (not)! 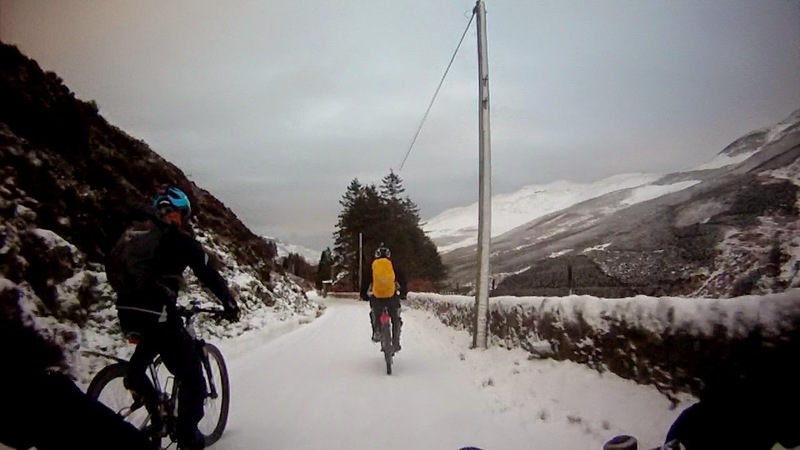 Not quite so much snow this weekend so it was easier pedalling today. Not so many offs either and Baz after purchasing knee pads and elbow pads for protection failed to fall off and provide me with a good photo. I went front ice spiker only, mainly because there was too much faffing around changing cassettes and brake discs involved, Clive went out on his Kona fully ice spikered and Baz went out on his Nobby Nics and annoyingly didn't fall off! 25.5 miles this morning with some hard climbing and the odd bit of tricky descending. Out in the snow today! The only way is up...though it was hard going! Unfortunately he misjudged the depth of a snowdrift and came to grief, I managed to rescue him but not before I'd taken a photo! An early start this morning, about 5.15am to fit a new rear derailleur to Baz's bike after last weeks breakdown and we had the bike up and running in half an hour. The inch or so of snow when we set off gave a good grip so no ice spikers were needed but once we got up into the hills there was quite a bit more with a bit of drifting as well. A fair bit of falling off, cursing and walking was done today with a new discovery, Mudhuggers and deep snow don't mix too well with occasionally the wheels jamming completely! Not the quickest ride we've ever done but it must have been one of the best fun ones! 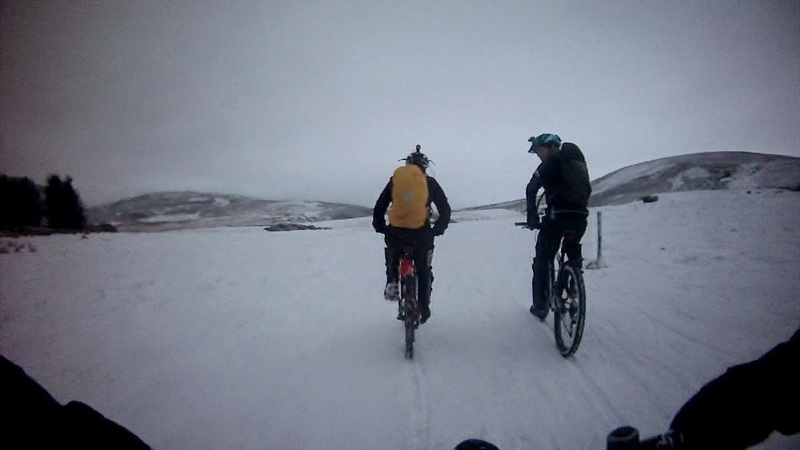 How do women never understand the fun grown men can have on a bike in the snow? The sun's up and its downhill (and ice) from here on. Baz's rear derailleur is in a sorry mess but it made it back! Off out at 6am this morning and bloody cold it was too! There was ice here there and everywhere and a few near misses or offs, in fact Clive was the only one to actually come off due to the ice. Once again he was experimenting with his new toy, the video camera, which caused much amusement as he forgot to remove the lens cover the first time, and then discovered he hadn't charged it up correctly the next time. He is however determined to succeed in his quest for exciting footage though I think he'll have to improve on today's effort which was a jerky, bumpy, ride in the dark down a rather boring bit of track!! Probably the most exciting thing today was Baz's rear derailleur packing in with10 miles to go, and actually holding together somehow to make it home. First ride of 2015.....and already I've had an off!! After a break of 2 weeks from biking during which I suffered a bout of something closely resembling flu it was time to get back up into the hills again so when Clive phoned to say he was going out it was as good a reason as any. His main purpose was to test out his new video camera which he'd bought himself for Xmas and I was the target as he set about lining it up on his handlebars. The ride was an easy one, thank goodness, my lungs have still not fully recovered, and the highlight of his filming would have been a spectacular crash we had when our handlebars locked together bring us both to the ground.........only thing was......it wasn't turned on then!